Caron Butler wants to let everyone know that he's for real about the Wizards potential and possibly being for real as well. 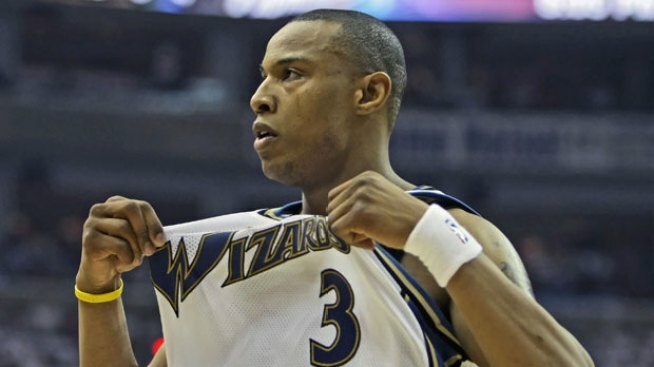 Caron Butler and the Washington Wizards have one goal: to win an NBA Championship. Pretty auspicious for a team with trouble getting past the first round of the playoffs, much less managing to stay healthy, much less dealing with the LeBron James led Cavs, who are looking more and more like an unstoppable train that will only shut down its engines in the offseasons between multiple titles. You won't hear much talk from the Wizards organization about just getting back to the playoffs. Can't build a house without the inevitable foundation, but you don't talk about that foundation as if it were something strive for. The Wizards have been preparing for next season for over a month now. It started with sappy piano music and heartfelt messages from Antawn Jamison and Butler. Now, Tuff Juice is on a nationwide tour looking for redemption and spreading the championship word. On Tuesday, Butler exorcised past demons of lame duck pitches. He successfully threw a strike to open the game for the Nationals, overcoming the ball he rolled to the plate last time. Some may still accuse Butler of throwing like a girl, but people with those offensive thoughts don't realize that it's not the how, rather the result. From hanging with Dwyane Wade in South Beach, to ringside at Pacquiao-Hatton in Vegas, to text messaging with the league M.V.P., Butler has been a busy man. He even plans to chill with Kobe while working on his strength and conditioning in L.A. next week. How many players would exchange 1:00 am text messages with their new coach? Include Butler and Flip Saunders in your answer. If anyone can reverse the path of fate, turning back the Curse O' Les Boulez, it's someone like Caron Butler, one who's kicked the karma of a troubled youth to become a community hero. Now if only some ofTuff Juice's toughness could rub off on the likes of Andray Blatche and Nick Young.